Dr. Balraj Sharma is the lead optometrist and owner of Inner Harbour Optometry. He was born and raised in Abbotsford, British Columbia. After completing his Bachelor of Science degree at the University of the Fraser Valley, he earned his doctor of optometry degree from the Illinois College of Optometry in Chicago, Illinois. In 2010, during his clinical experience at the Illinois Eye Institute, Dr. Sharma gained unique skills in managing ocular disease, and solidified his passion for the eye care field. 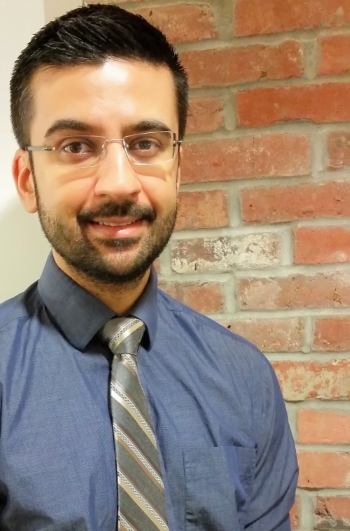 In 2011, Dr. Sharma made the move back to British Columbia, settling in beautiful Victoria, British Columbia, and began practicing with Inner Harbour Optometry. In 2014, all of his hard work and ambition allowed for Dr. Sharma to take over the practice. Dr. Sharma has great pride and satisfaction in being the owner of Inner Harbour Optometry, as it allows him to ensure his mission of providing quality care to each and every patient is fulfilled. He is keen on staying up to date on the latest research on eye diseases and eye health studies, so patients receive the best care possible. Dr. Sharma also dedicates himself to writing regular blog articles for patients to help educate them on prevention, detection, and treatment of eye diseases and eye health issues. His passion for helping people see and understanding that not all members of our community are necessarily mobile, lead him to dedicate his time to various care homes for the elderly. The experience really taught him how unique each person is and reinforced how an eye exam can change a person’s life. In his spare time, Dr. Sharma enjoys spending time with his wife and young daughter in the city. He particularly loves the friendly atmosphere, wide variety of restaurants, and many hidden gems! He hopes to grow his practice for many years to come and make a difference in people.